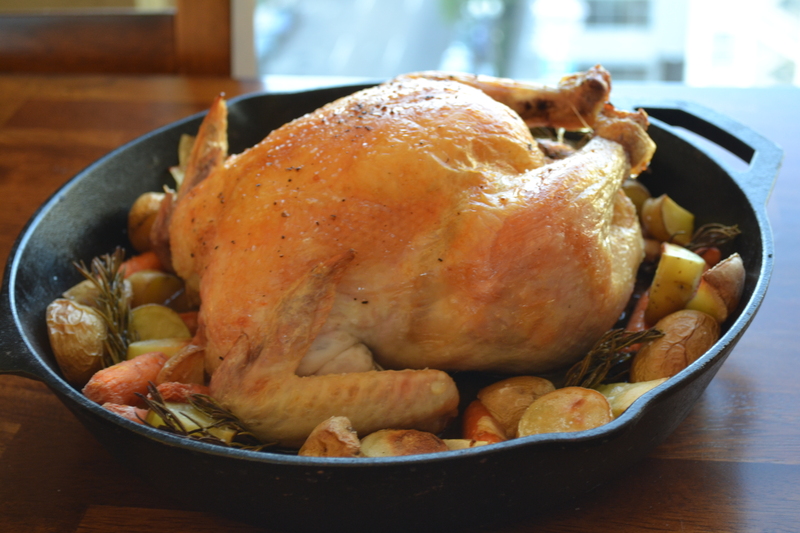 Roasted Chicken | how 'bout some cake? To me, roasted chicken is a very “wifey” thing to make. You know, a healthy home-cooked meal; the kind of dinner your husband comes home to after a long day at work. And since I’ve got a ring on my finger, I figured it was time I tried this (allegedly) simple dish. 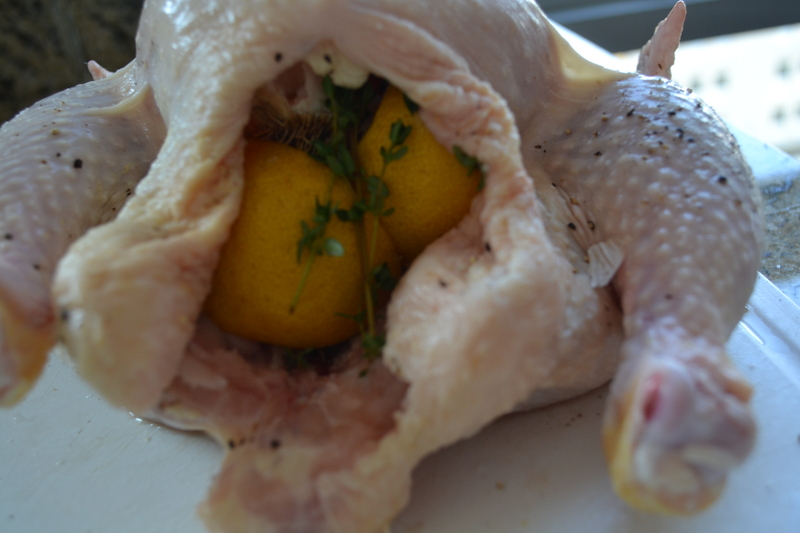 Since I’d never cooked a whole chicken before, so I had no idea how gross it was! I’d only seen lovely pictures of a golden roasted bird, not the part where you reach into the animal carcass and pull out its organs. But that’s what you have to do. And I did it. And it was worth it. 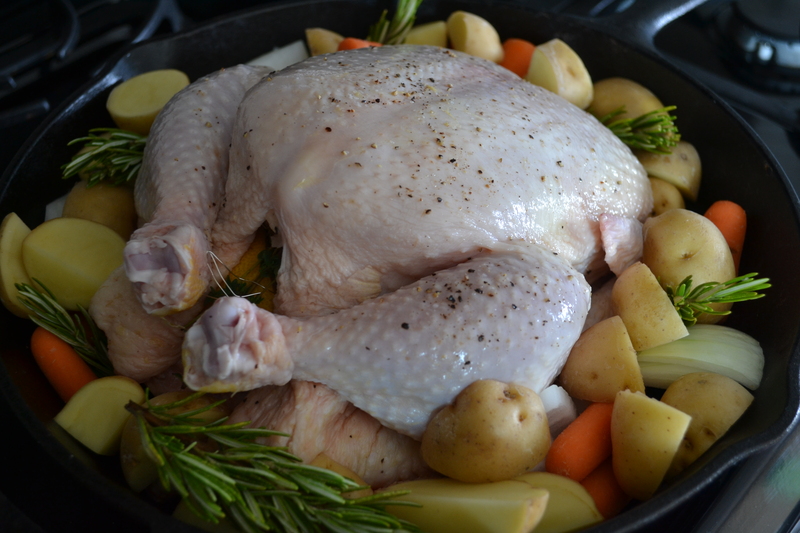 Then I preheated the oven to 425°F and prepped the chicken. This included tearing out the above mentioned “giblets”, “trimming the neck” (which was really gruesome), and removing any tiny feathers, then rinsing it and patting it dry (inside and out) with paper towels. Last, I melted about 2 tbsp. of melted butter and painted it onto the chicken for a nice crispy skin. I poured the leftover butter over the surrounding veggies, and sprinkled them with salt and pepper before popping it into the oven. I set my timer for an hour and a half and waited patiently while a the scent of baking herbs filled my condo. 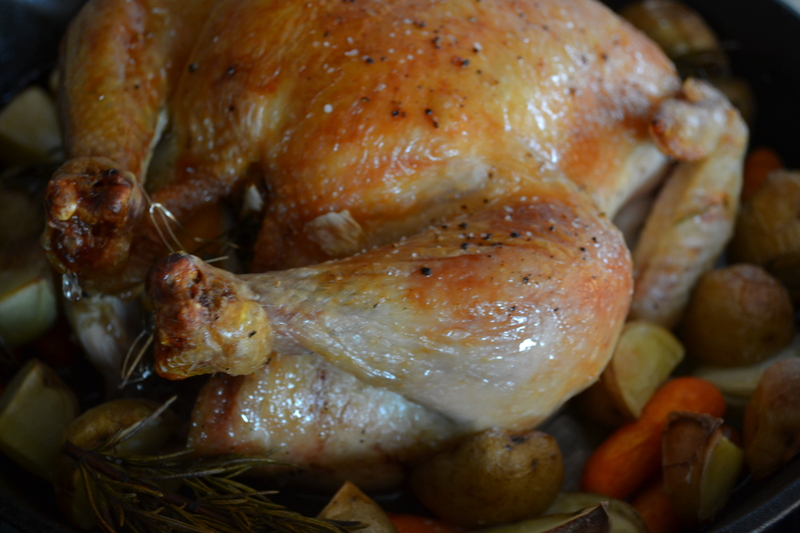 If you are roasting a smaller bird, it may only need to cook for an hour. It’s done when you cut between the leg and thigh and the juice runs clear. 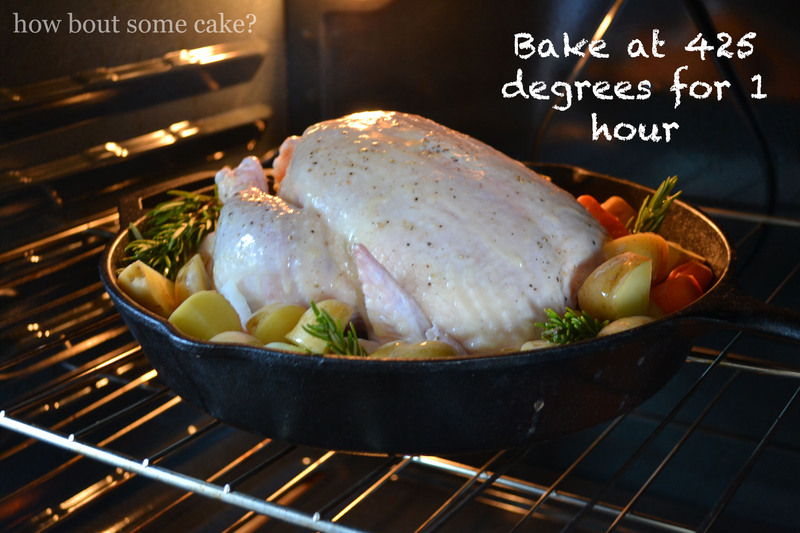 Remove it from the oven, cover with foil, and let it sit for about 20 minutes. Then serve! It came out amazing. Sure, I almost joined PETA once or twice throughout the process, but it really was worth it. And not nearly as hard as I imagined (once you get past the butchering parts). What really surprised me was how delicious the vegetables were. Jason couldn’t get enough of those carrots- next time, I’ll definitely add more of them! This entry was posted in Food & Recipes, Healthy meals & snacks and tagged cooking, healthy cooking, healthy recipe, recipe, roasted chicken recipe. Bookmark the permalink. Your chicken looks delicious! Dental floss is another good substitute if you don’t have kitchen twine when cooking. Cleaning a chicken is really the most disgusting thing ever. But when it comes out looking like yours, it’s all worth it! 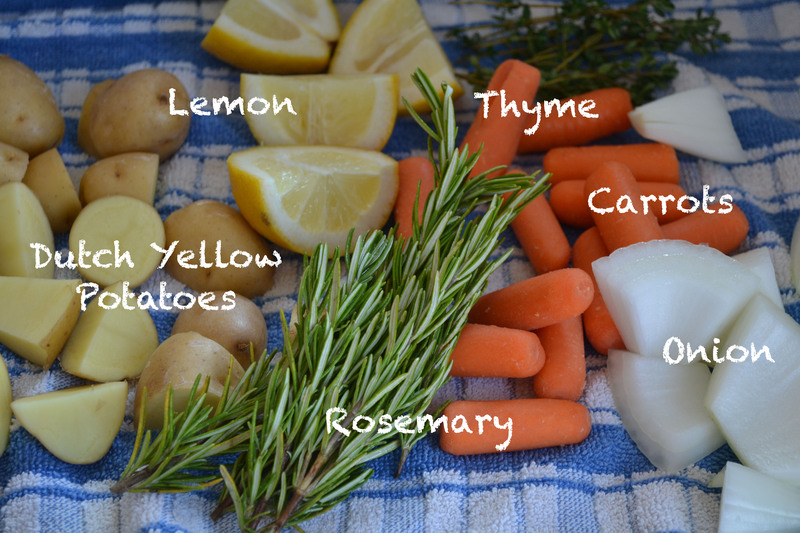 I love the idea of cooking the potatoes right along with the chicken. Yum! Pingback: Diet-Friendly Dinners | how bout some cake?